Word Processing that Brings It All Together Commercial Complete has its own built-in word processor that is designed specifically to make a real estate professional's job easier. Property information and reports can be inserted directly from the built-in database. Automated narratives are easy to design and use. Images can be easily inserted and edited sing our built-in image processor. Full narrative appraisals, broker opinions, listing presentations and more can be assembled in minutes. A PDF can be created with the click of a button. Works just like Word for me, but it is designed for real estate professionals. Designed to Meet Today’s Rigorous Demands Commercial Complete is a time-tested standalone software product that is designed to meet the rigorous demands that commercial appraisers face today. 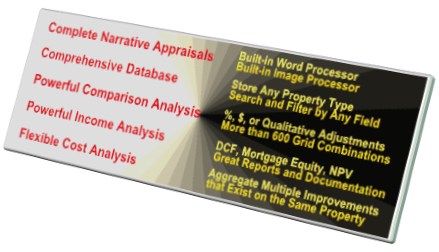 Appraisers know how difficult it is to automate the many parts of the commercial appraisal process; gathering data, keeping track of your research, getting images to the proper location on your computer, writing and editing the narrative, inserting exhibits, documenting your workfile. Should we mention the most important part, which is getting the value and documenting how you got it? Comprehensive, Yet Designed for Ease of Use Commercial Complete has taken a giant step ahead as a true solution for real estate professionals. Everything is integrated and dedicated to making your job easier; photo editing, screen capture, direct uploads from your digital camera, automated narrative assembly and direct linking to mapping and census data. But most important, Commercial Complete brings to you the same comprehensive analysis capabilities that commercial appraisers have relied upon for years. Income analysis that is detailed, accurate, and well documented. Comparison analysis that enables you to easily compare sold properties, make adjustments, and document your conclusions with well designed reports. Cost analysis is included to provide additional support for your conclusions. Our clients use Commercial Complete daily to gather information, perform analyses, research comps, edit photos, and assemble narrative documents. It is not a product that you will buy and then never use. Reliable, Real Software Until now there has been no reliable way to automate the commercial appraisal process. Of course there are many individual tools that do assist. MS Office helps a lot with its word processing and spreadsheet modules. If you know how to create links and macros - better yet. A few appraisers have even done so well at assembling MS Office templates for their own office that they now sell the templates as a software product. Our hats go off to them. But frankly, MS Office is not up to this kind of a job. Too many components, updates, modifications, and work-arounds. Simply put - too complicated. A package of templates is NOT the same as a real, standalone software product that is designed specifically to assist in every aspect of the appraisal process. There is just no comparison. And there are no spreadsheets, no links, no macros, and no MS Office. Call Us for a Personal Demonstration We invite you to explore the many benefits of Commercial Complete. Call us at 800-884-1630 and we will lead you through a personal demonstration. Recent Testimonial 10-10-2014 Just finished my 10th appraisal in Commercial Complete, and it has completely changed my life. After 40 years as a broker/appraiser, and 22 years as a General Appraiser, this is the best, most complete program. No more procrastination, and it is the most professional presentation I have ever done. Love the extra comps, and the adjustment Grid, fast and accurate and great flexibility, no more worries about losing all the information. Great Program, and thanks for the continued support. Tom Walsh, General Appraiser. Scranton, Pa.